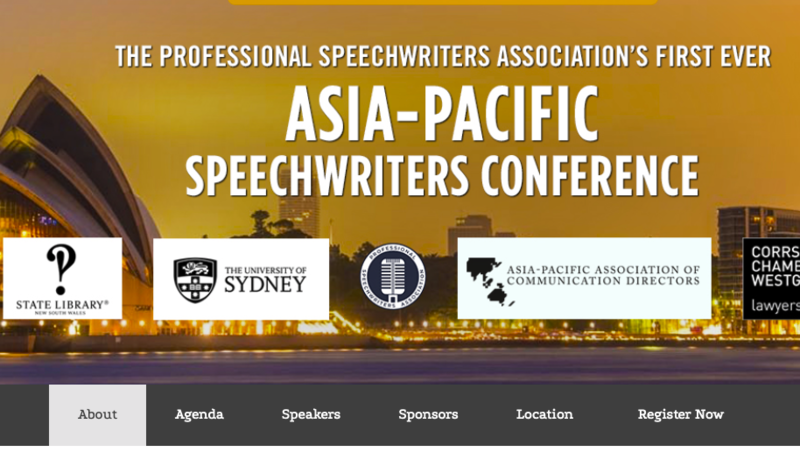 This was the overarching message that I gleaned from the three-day conference which the US-based Professional Speechwriters Association (PSA) convened in Sydney, Australia in February. 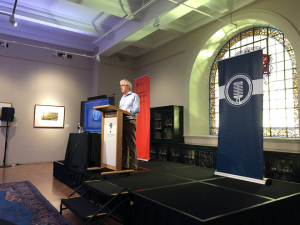 Held at the State Library of New South Wales, the first-ever speechwriting conference in Australia brought together about 40 Australian-based speechwriters and other communication professionals. The majority hailed from government departments in our capital city, Canberra. But there were also representatives from state government agencies and the private sector, as well as freelance writers. It felt like finding my tribe. Don Watson, who was the chief speechwriter to former Australian Prime Minister, Paul Keating, lamented the decline of public language, observing that ‘speech is the midwife of thought’. Bob Lehrman, who was the speechwriter to former US Vice President Al Gore, stressed that a speechwriter’s job is to help their speaker sound as authentic and compelling as possible. Australian speechwriter Lucinda Holdforth—who has a very apt surname for a speechwriter—said powerfully-argued speeches are vital in countering growing threats to democracy around the world. And New Zealand speechwriter, Christine Ammunson, who wrote a landmark speech for the head of a Maori trade mission to China, shared her expertise on connecting with other cultures. There were many other invaluable insights—from novelists and poets, columnists and creative strategists, as well as from many of the experienced conference participants themselves. We discussed the role of speeches in setting the direction of public discourse. We spoke about the natural scepticism of Australian audiences for the art of rhetoric. We were encouraged to turn to poems, song lyrics and screenplays as sources of inspiration. Yet the common thread amongst these reflections was simply the importance of selecting words that convey something meaningful and do so with integrity and humility. Many presentations were interspersed with extracts from great speeches in modern history. I noticed when reading these texts that many convey a sense of a spiritual dimension to human life. And in closing his address to the nation after the space shuttle Challenger tragedy in 1986, Ronald Reagan said the lost astronauts had ‘slipped the surly bonds of earth to touch the face of God’. We have heard great orators this century too—Barack Obama being the most high-profile example. But I suspect the transition to an exclusively materialistic worldview has caused many speeches to become a little more clinical, a little more devoid of poetry and rhythm and searing beauty. Perhaps this is partly why fewer speeches capture our hearts these days—if we view people as the product of a set of inputs or as cogs in a machine, language is bound to become more mechanical. Yet I feel materialism can still be beautiful. A couple of my Australian speechwriting colleagues have a remarkable capacity to convey scientific truths in a way that is eloquent and engaging and that conveys a sense of wonder about the world. They point to the 100 billion cells that make up the human brain and the 46 billion light-years that comprise the universe and the quest in quantum physics to discover the nature of time and space. I think theirs is a tremendous endeavour. I believe too that in an era of increasing automation, the speech—that means of communication that still brings us together in large numbers—might gently touch on what it means to be human. This is no easy question, and the depths of one’s inner life are often a mystery. Yet truly great oratory may be one way to peel away our layers and free us from our separateness, or, to paraphrase the renowned philosophical novelist Franz Kafka, to break the frozen seas between us. This doesn’t mean papering over realities of the world like poverty, war, inequality and rising seas. But it does mean speaking of our ultimate connectedness to each other and to all of life, whether this conviction rests on a scientific, a spiritual, a humanist, an ethical, or some other foundation. The PSA’s Executive Director, David Murray, ended the final presentation of the conference with this stirring footage of Robert F Kennedy announcing the death of Martin Luther King in 1968. His call for us to ‘make an effort … to understand with compassion and love’ rings true to this day. In what can be a solitary, isolating profession, it also reflects what I believe is a key mission of speechwriting: to help a speaker forge a deep and meaningful connection with their audience.